“A Bear Called Mur will charm readers of all ages. [– ] As we know, all bears go for their winter sleep once they have filled themselves up with a store of food from the summer. This children’s book is about a bear that doesn’t get tired at all, even if she should be obedient and stumble into her winter den at the same time as the others. That’s how Mur’s long, dark and boring winter begins. All the elements – the story, the text and the illustrations – are attractive in this book. Every child and adult may have the experience at the heart of Kaisa Happonen’s narration, of how it feels to be in some way quite different from others. The story, and Mur the Bear, encourage readers or listeners to be brave, to be themselves and to seek their own place in the world. This wisdom is conveyed emphatically yet playfully, via repetition, and a poetic manner of expression. For their part, Anne Vasko’s illustrations are funny, precise, colourful and beautiful. All the elements support each other elegantly. For example, the colours of the pages do what is necessary to emphasize the emotional state of the main character. 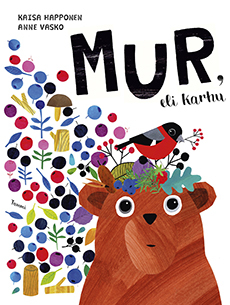 “Of this year’s children’s books, A Bear Called Mur definitely ranks among the best in its balance of elements. Mur is a bear who doesn’t want to and simply cannot go to sleep in the winter like all the other bears. That’s the essence of the tale, simple, but containing so much. Kaisa Happonen’s story is written with a twinkle in its eye. It is warm, funny, full of feeling, full of life. It has a lilting, soft quality that finds its way into the mouth of the reader, like a snowflake on the tip of the tongue. So, the story consists of one little, big and unique snowflake. The book is delightful to read aloud, and the curve of the tale is perfect. There’s exactly the right amount of text and repetition for a picture book, and it makes me chuckle with glee. The story of Mur encourages children to be themselves. It empowers, and it gives support.